Tristano Tryptych. Images courtesy of and copyright by Carl Chiarenza. 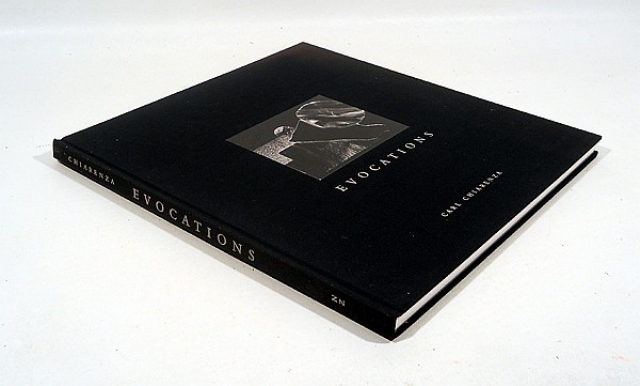 Evocations is one of seven books of photographs by Carl Chiarenza. Published in 2002 it was his second major monograph. The exquisitely designed and meticulously printed book presents a selection of 80 of the artist's most important photographs from the mid 1980s to 2000. It provides an overview of collaged, black and white images from nearly two decades. In addition to being a renowned photographer he is regarded as one of the foremost scholars in the field. 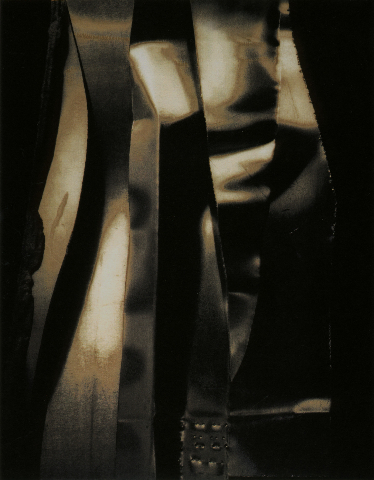 His photographs have been seen in over 80 one-person, and 260 group exhibitions since 1957. Some years ago he ceased writing critical essays and reviews. The intent was to focus on the studio. He regularly sends e mails to friends and scholars with excerpts and links to a selection of what he considers to be important articles. Chiarenza is Fanny Knapp Allen Professor Emeritus of Art History, and Artist-in-Residence, at the University of Rochester. He was Fanny Knapp Allen Professor there (1986-1998). At Boston University (1963-1986), he was Chairman, Director of Graduate Studies, and Professor of Art History. He earned a Ph.D. from Harvard University in 1973. 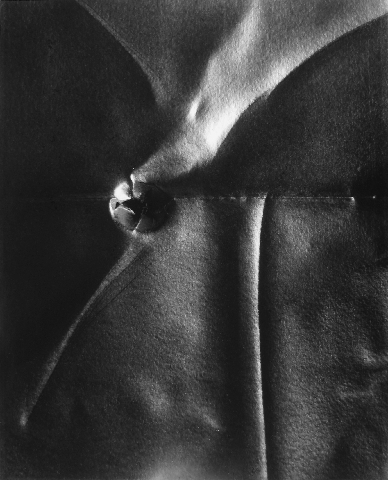 His dissertation on the work of Aaron Siskind was the first in the field based on a living photographer. Even though Evocations was published some fourteen years ago it is fresh, stunning, and remarkable. The inscription of to a gonzo from a gonzo (paraphrased) was deeply moving. It has encouraged me to think in what sense we share the sobriquet of gonzology. On many levels I have regarded him as a rock-steady, grounding influence on my own peripatetic, far flung, disorienting odyssey of a life in the arts. There has always been something reassuring about his paternalistic scolding, when called for, and mentoring encouragement to follow my own muse. What more could one ask for in a professor and advisor. At Boston University I audited his surveys of the history of photography. In addition to lectures, graduate students met with him once a week for reading and discussion. 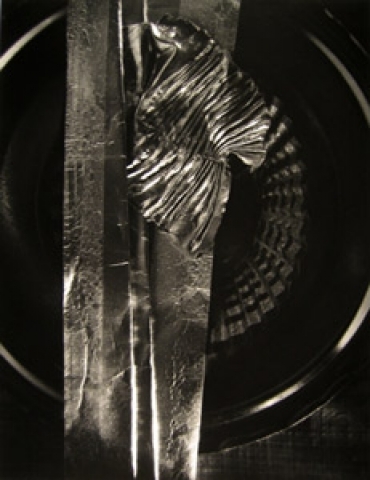 That intensive experience helped me to appreciate the rich tradition of photographers from Stieglitz, to Weston, Callahan and Siskind who composed equivalences between nature and abstraction. 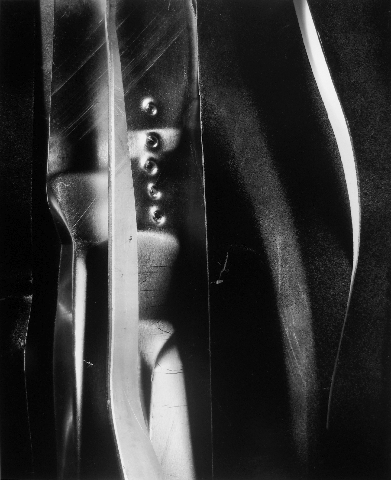 As a part of the generation of the New York School and abstract expressionism, with his camera, Siskind created images that evoked comparisons to the black and white paintings of Franz Kline. While remaining within that tradition Chiarenza expanded and went beyond seeking to find subject matter in nature. There is a similar conundrum when examining the subtle, grisaille tonalities of superbly reproduced images in this book. One struggles against a primal urge to find something in the photographs of collages. In the notebooks of Leonardo da Vinci he wrote about studying cloud formations and the patterns of water stains on walls. The devout have reported seeing the face of the Virgin Mary in a slice of bread or frost on the window. Many of us at some point have been asked to relate what we see in the ink blots of the Rorschach test. Chiarenza sets for us that greatest challenge. We are required to tone down and turn off the reactive mind and see the image for what it is. The task is to appreciate non objective work on its own terms. Within its parameters the work is richly complex and diverse. 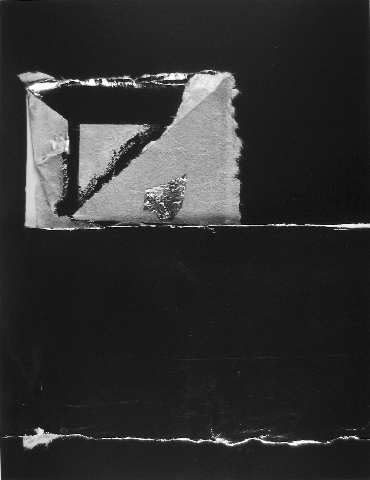 Torn and assembled, collaged papers are carefully illuminated and photographed. 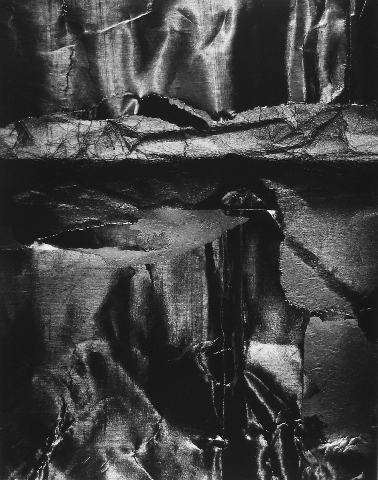 From there he pursues the alchemy of work in the darkroom with manipulations of paper and chemicals. The last four images in the book "Samurai" and three identified as "Untitled" were created in the digital process as Iris prints. They date from 1999 and the last is labeled 1990/ 2000. 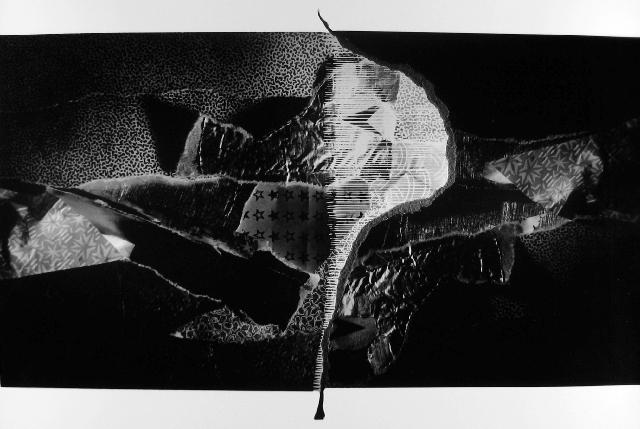 It implies that an older work was reconfigured as a digital print. 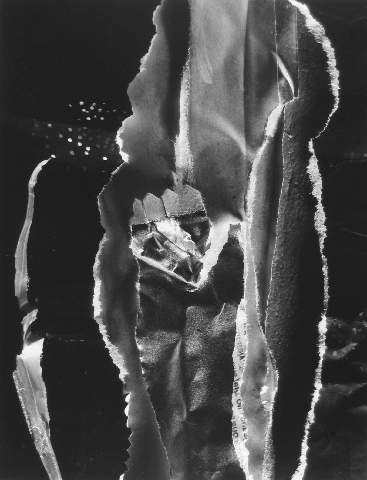 There is a witty aspect of art about art as the artist has used some of the packing materials of his photo paper as elements in the photographed collages. The design of the book allows for a lot of white space. In the early pages of the book images are relatively small and square on the page. Moving along the images explode into ambitious, complex, panoramas. We unfold three pages several times. 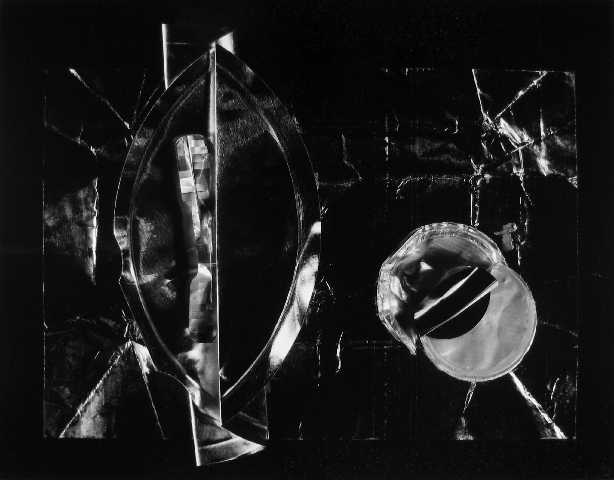 One becomes absorbed by the range of materials from matte collaged paper early on to later use of tin foil and its reflections of light. Reading through a check list of images do titles offer clues and insights? It was a surprise to discover and then study “Tristano Tryptych” from 1991. Before gravitating to photography Chiarenza played jazz saxophone. We share a love of that music. The blind pianist, Lennie Tristano, evolving out of bop was a leader of the austere cool school. As undergraduates a group of us made pilgrimages to New York to hear him perform with combos featuring Lee Konitz and Warne Marsh. Looking long and hard at the image I tried to find Tristano. There was a sense of tempo in the spacing of the horizontal composition. The riffs entailed several, relatively narrow, vertical strips. Providing texture there were small, printed, decorative patterns. That’s about as close as I got to Lennie’s bop. It was a temptation I couldn’t resist. I could feel Carl from a distance with a chiding look at the grasshopper implying don’t go there. Keep your eyes on the prize. Indeed there is no explanation of the work. But on flanking pages, printed in soft gray, are a number of poems by Robert Koch a former teacher and friend from Rochester Institute of Technology. That gave me a sense of the passing along of traditions and aesthetics. It reminded me that art, and the teaching of it, is about the generosity of giving. "I'm jealous of your evening (s? ), listening to/seeing Tristano, one of my favorite musicians. I read that he was extremely demanding of his pupils, requiring that they sing every note of their solos, forcing refinement and exactitude, eliminating accidental or random notes, regardless of how inspired the accident might have been."